The Joker continually forces people into life and death decisions, whether it is to kill another to save yourself, to save a family member, or to choose which person to save (and which person dies). Towards the end of the film, two ferries shut down while crossing a river, one full of convicted criminals, the other with everyday civilians: men, women, and children. Both learn that their boats are wired to explode and that they have the detonator to the other boat. If neither destroys the other by midnight, the Joker will incinerate both. Upset that the captain chooses not to destroy the inmate ferry, the civilians demand a vote. Under the pretense of democracy, the crowd easily determines to kill by a landslide, 396 to 140. But the captain cannot bring himself to turn the switch. To the despair of many, it seems no one can. From the “social experiment”, as the Joker describes it, we first see that we have a conscience that often prevents us from doing what we know is wrong. Second, that conscience can be less active when we vote. In fact, the passengers even use democracy as excuse to do evil, as though majority rule somehow changes right and wrong. It’s like, as has been said about democracy, two wolves and a sheep deciding what to have for dinner. Consequently, we might vote for policies that we cannot act out ourselves in good conscience. In this way, people easily use government do their dirty work. If you can’t in good conscience torture someone, doing things “that are unthinkable”, don’t support a presidential candidate who praises torture. If you could never personally kill the family member of a terrorist, don’t vote for someone who says we must. If you would feel guilty forcefully removing a undocumented immigrant, separating him or her from their home, employment, friends, and family, then maybe that governmental policy is wrong. If you could never hit a button to fire a missile at a jet in a no-fly zone over Syria, possibly starting a war with Russia, then perhaps we shouldn’t vote for a candidate supporting this foreign policy either. Am I being too idealistic?3 Shouldn’t we vote for the candidate who will do less evil? Or perhaps we should be like the inmate who throws the detonator out the window, in this way saying, “I’m not playing your game anymore.” Let’s make a stand against a system that gives us choices no better than the Joker. 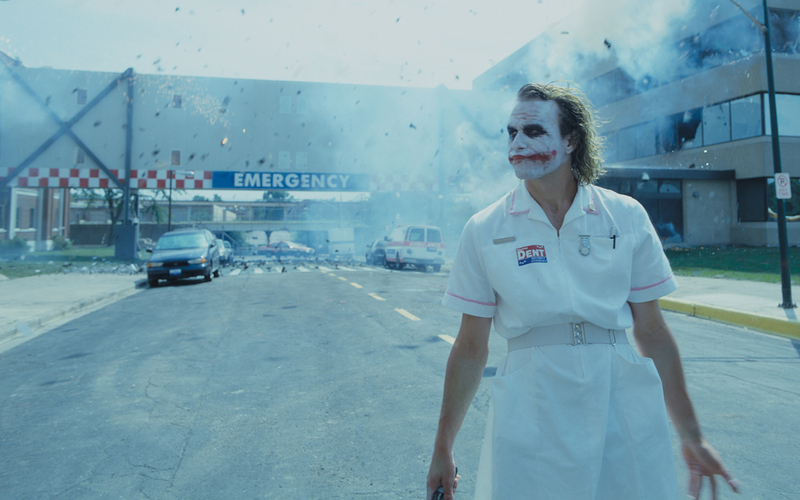 While the Joker wanted the public to believe the only options were to murder a man or thousands in a hospital would die, the third choice to evacuate the hospital worked rather well. © Warner Bros. There are other options. There are many third party candidates, including those from the Libertarian or Green party, who have less interventionist policy. This translates to doing much less evil around the world. As you may be able to tell, foreign policy is important to me, especially in a presidential election as the president has greater influence in this matter compared to others. Of course, that is my priority, informed by my conscience. Hence, I’m not telling you to vote third party. I’m not actually telling you to vote or not vote for anyone. 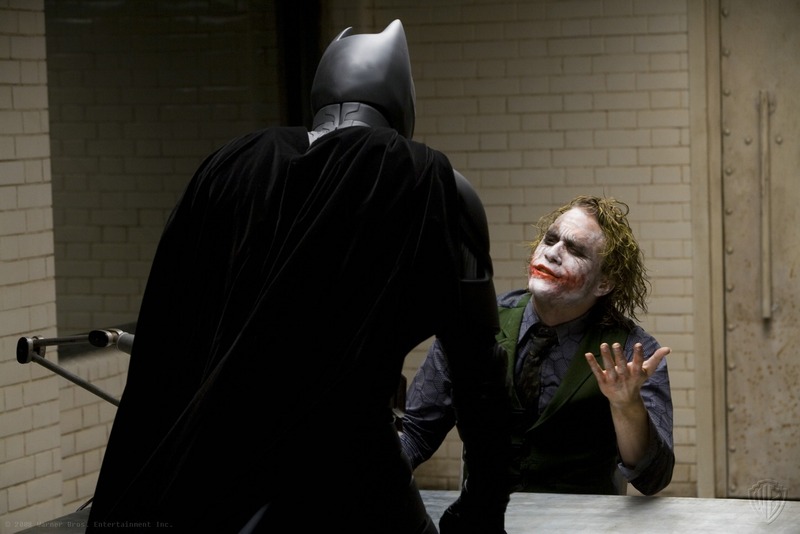 Rather, based on Batman: The Dark Knight, I’m proposing a rule of thumb: don’t vote for anyone who will do something that you cannot do yourself with a good conscience, even if it means voting third party, writing someone in, or leaving a row on the ballot blank. Thanks for putting this up. I had a chance to put in an early ballot this week, so I tried my hardest to stop thinking about it since. This gave me a chance to digest some of what happened. I hear what you’re saying about the option of abstaining. Incidentally, because of the way the way our (Illinois’) voting machine worked, I actually didn’t have the option to abstain on individual tickets; I had to vote for all categories or none, including the unopposed tickets as well as 50 local judgeship slots, of whose candidates I knew absolutely nothing. I really would’ve liked to abstain on options which I though were beyond my competence to decide. It was truly frustrating that even that, the option to abstain, was taken away from me. What I find interesting about your analysis is that there’s a subtext in the Dark Knight trilogy in which every choice the characters made was in the context of a deeply corrupt and broken society. In the first movie, Bruce Wayne sees the corruption of the Gotham police and city government, and he consequently shunned reform through the political system and chose to embrace a vision of Batman, a “domestic terrorist for good” who eliminates enemies through fear and terror and accountable to no one. Given the option of different types of corruption, Wayne “voted” Batman. As the first movie ended, more and more people started “voting” Batman too, first Alfred, then Jim Gordon and Rachel Dawes. Interestingly, the story arc of the second movie then follows Wayne’s attempt to change his “vote”. Knowing that a real city needs a real civil society that Batman has no place in, Wayne builds up Harvey Dent and persuades Gotham to vote Dent, both as district attorney as well as the embodiment of the Gotham-that-could-be. But where hope really does reside is in the rest of the characters: Alfred, Gordon, Rachel, even Dent. Because even if none of them were able to become the Batman that Gotham needs, their accidents of status, position, integrity, and tenacity were all needed for the Batman story to succeed. Yes, in terms of the movie they were simply supporting characters, but in terms of plot, they were just as indispensable as Batman himself to bring Gotham to redemption. When they were needed, each of them answered the call to the best of their abilities, and even when they fail, their failures don’t negate all the good they had accomplished beforehand. So this is where I see the greatest parallel between The Dark Knight and my spiritual journey. A savior has come, and I’m not it! But, there’s still a place for me to take part in the redemption of the world, and even though we’ll never achieve a state of perfection in this life, we are able to do some good, which can never be completely erased. As for the election, well, I still don’t like the options before us, and I’m already starting to wish I had chosen differently for some of the contests I did. But, even if our politics is dirty and broken and corrupt: we do have a choice. Because, no matter who wins tomorrow, the real battle for us isn’t in the ballot box as the media and the campaign advertising want us to believe, but in our daily lives and the blessings that we’re called to perform over others each day, in accordance with our accidents of status and possessions and relationships and everything else. We can choose to bless, we can choose to heal, and we can choose to renew, because those choices are always before us. And, yes, voting is one of those blessings we can choose to give, so go vote as you’re inclined. But there plenty more blessings that are ours to give, as we choose to. Fantastic points! Very well said. I love your point: “there’s a subtext in the Dark Knight trilogy in which every choice the characters made was in the context of a deeply corrupt and broken society”. That applies both to us and Jesus’s audience, a people oppressed by the Roman Empire. As political options were non-existent, He invited them to be part of an alternative solution, members of His Kingdom on Earth, a community of Love that follows His lead. Given the outcome of the election and all that might ensue, as my wife points out, our calling to love others, especially the vulnerable, has become overwhelmingly and increasingly evident.